EMT had such a great time on our whirlwind tour of promo, we just had to drop a greatest hits recap. Check out the highlights below from our adventures at ASI Orlando, PPAI Las Vegas, SkuCon, and ASI Fort Worth. EMT is honored to have been voted the 2019 Counselor Distributor Choice Award Winner in the Jewelry and Emblems category. Click here to read more. EMT’s Multi-Tools exhibit was also voted “Most Useful” ASI Orlando. EMT was proud to be the medal sponsor for the Dollars4Disasters step challenge at PPAI Expo. Dollars4Disasters was able to raise $2,000 for victims of the California wild fires. Click here to read the full press release. Once again, the CommonSku Skummunity gathered in Las Vegas for the coolest event in Promo. EMT was honored to help sponsor this awesome event and contribute some killer swag to attendees. Our good friends at Promo Kitchen hosted a smokin’ mixer in Las Vegas. Oh, and did you know our very own Brian Stidham won the t-shirt design contest? Our PROMO ROCKS collectible lapel pins and PROMO AF™ patch hats were some of the most popular swag at Expo. Demand was so high, we had to drop a re-release…and for a good cause. 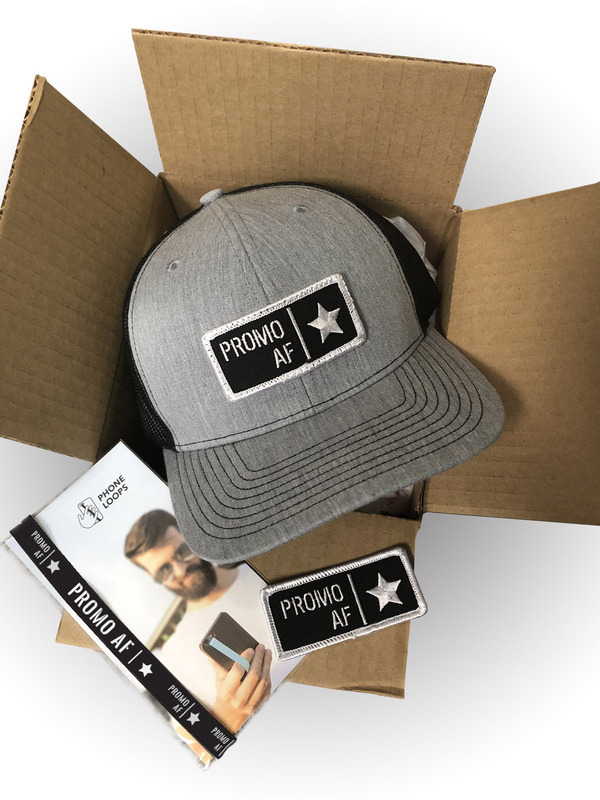 Harnessing the power of the promo community, EMT created a PROMO AF™ swag box a with proceeds benefiting the National Kidney Foundation, in honor of our late founder, Steve Weinstein. True story bro. Of the phones that are dropped and sustain damage in a year, one in five of these has water damage from falling into a toilet. This is an alarming statistic in light of the fact that we live in an age where people would rather lose their wallet or purse than their mobile device. What exactly do you do in that situation?! We here at EMT have a preventative solution to this less than pleasant situation. This solution is called the PromoLoop! Our PromoLoops come in three versions: The Petite Loop, Ninja Loop, and the Awareness Loop. The three are different, but similar in design and exist for the sole purpose of saving cell phones from costly, or utterly disgusting, falls and drops. In addition to being quite handy, the sublimated print method means that your brand message will be displayed in vibrant, full color. And, thanks to the fact that most people keep their phones with them day and night, users and the people they interact with will be exposed to your message nearly 24 hours a day, 365 days a year. There are very few products available in the industry that can boast that kind of exposure rate. Still not convinced that PromoLoops are the right fit for your next promotion? Consider the fact that PromoLoops can be used by people of all ages and are a great fit for almost every demographic. You can also feel free to watch and share these videos. They do an incredible job of telling the PromoLoop story and helping to show your clients that for just about $2.00 or less, depending on quantity, they can purchase a small product that will make a big impression over, and over, and over again. So…Are you ready to put PromoLoops to work for you? If so, just email customercare@emteasy.com for pricing, samples, and/or virtuals. We’ll help you keep cell phones out of the toilet and keep your clients’ brands in everyone’s hand! “I have known Steve for more than a decade and can say from both my strategic business brain and from my heart, there is no one more focused and driven to provide high quality service and products for his customers than Steve and EMT. I’ve seen Steve diversify his company and product line in order to meet the needs of a changing promotional products industry. He makes wise and innovative choices about what to add and also deduct from his product line. Although he is well known in the industry for his strong opinions on what works and what doesn’t, he is flexible enough to try new things.